About twenty kilometers from the city of Boulogne-sur-Mer, near the hamlet of Mimoyecques, in northern France, lies a once-secret underground Nazi base. 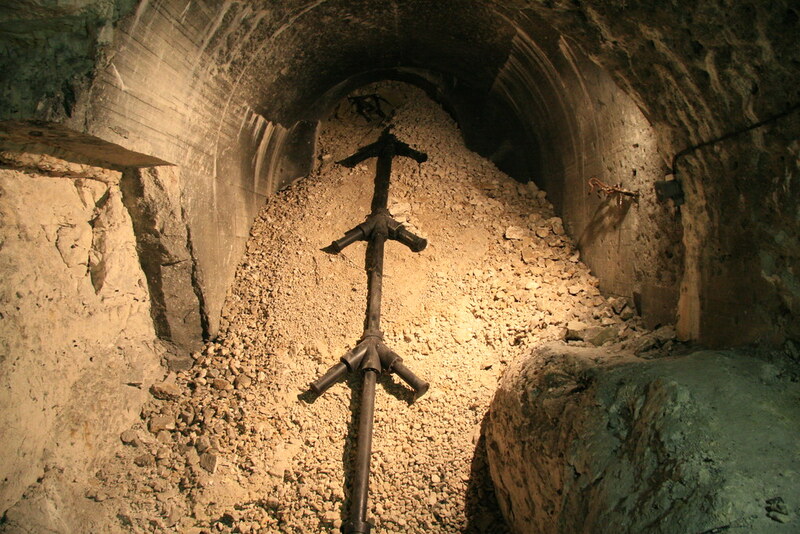 Dug out under the limestone hills, the sprawling complex consisted of a network of tunnels linked to five inclined shafts in which Hitler planned to install more than two dozen superguns, called the V-3, all targeted towards London, 165 km away. The base was never completed, and its purpose of attacking London never realized. Had it been successful, the attack on London would have constituted—in Winston Churchill’s own words— "the most devastating attack of all". Late in the war, the Germans began developing a series of "retaliatory weapons", called Vergeltungswaffen, that were exceptionally long-range for the time. The first in the series, the V-1, also known as the “flying bomb”, was the precursor to the cruise missile. The V-2 was the world's first long-range guided ballistic missile. The third in the series, the V-3, was supposed to be a supergun with a long firing range. Prototype of a V-3 cannon at Laatzig, Germany (now Poland) in 1942. The V-3 was basically a cannon with a long barrel, over 100 meters in length, with multiple charges placed along the barrel's length. The charges were timed to fire as soon as the projectile passed them in order to provide an additional boost to the shells. The gun was still in its prototype stages, but Hitler was eager to have a battery of V-3 guns in France to supplement the planned V-1 and V-2 missile campaigns against London.